In 15 Park Avenue, veteran art film writer-director Aparna Sen takes on an exploration of schizophrenia and its reverberations through several lives. Konkona Sen Sharma (Aparna’s daughter) gives a distressingly compelling performance as Mithi, stricken with schizophrenia as a young woman and now suffering elaborate, chilling delusions. Mithi is cared for, sometimes with more patience and other times with less, by her older sister Anju (GOAT's favorite, Shabana Azmi). Anju is a driven and accomplished physics professor, but she can’t seem to manage a personal relationship. Among Mithi's delusions, she believes that she is married to Jojo Roy, a man she was engaged to prior to her final psychotic break. When the real Jojo (Rahul Bose) reappears, all three of their lives are shaken. I expected a lot from this film – Aparna Sen has a stellar track record and the cast is fantastic – but 15 Park Avenue did not quite match my expectations. The early portions of the film were the strongest. Aparna did a brilliant job of handling the schizophrenia sensitively while still making me squirm with discomfort watching some of the more difficult scenes. In one scene, she allows the viewer to hear one side of a telephone conversation but not the other, contrary to the usual movie convention of viewer omniscience. The result is a disquieting sense that one is eavesdropping, intruding on the characters' private space. And Aparna Sen's script and direction extracted a stellar performance out of her talented daughter - Konkona chillingly captured the earnestness and confusion of Mithi's distressing, delusional shadow world. But as delicate and spot-on as these aspects of the film were, many of the scenes without Konkona had a woodenness of dialogue that was distracting and disappointing. Shabana did a good job even with the weaker material she was given - her Anju was complex and subtle, part selfish, part protector. The fact that she was a scientist was, unfortunately, a token, a shorthand for her rationality and uber-competence. No delicate metaphors were built on this, though they could have been. (Still, as a former physicist, I got quite a charge out of listening to my beloved actress’s honey voice talking about quantum mechanics.) But Rahul Bose, though I like him, was not quite up to the task of giving life to Aparna's less well-crafted dialogue. The film's ending was ambiguous - some viewers may enjoy the open-ended conclusion, but I found it abrupt and unsatisfying, one of several ways in which 15 Park Avenue failed to live up to its rich potential. One girl, two guys who love her - sounds like a typical Bollywood love triangle. But Jaan-e-mann ("Beloved") takes a very unusual look at that old story, with a surreal, self-referential, and theatrical style that uses the full range of freedom offered by the medium of the movies, rather than the constraints of the literal, to tell its tale. At the beginning of the film, Suhaan (superstar cutie Salman Khan) is a semi-employed and divorced actor trying to figure out how he is going to pay off his ex-wife Piya's alimony demands. In steps Agastya (Akshay Kumar), a loveable nerd who had harbored a secret crush on Piya when they were schoolmates. Suhaan and his uncle Boney (Anupam Kher) hatch a plan: Get Piya (Preity Zinta) to marry Agastya - once remarried, she will no longer be entitled to alimony. Piya lives in New York now, so Suhaan and Agastya head overseas to pursue their mission. What follows is a tender romantic comedy along the lines of Cyrano de Bergerac - the bumbling Agastya is coached via earpiece by the smooth-talking Suhaan, who remains hidden by a series of ever-more-silly disguises. As the mission approaches fruition, Suhaan must struggle against the love he still feels for Piya. And the mission almost falls apart when Suhaan is thrown a curve ball that I will not give away here. So much for the plot. From its opening scene - a peculiar sequence that takes place in a space station in orbit about the earth - Jaan-e-mann takes an extraordinary approach to the telling of a fairly ordinary story. Throughout the film, moments of surrealism operate to weave the story elements together. In the early scene in which Suhaan discusses his divorce with his uncle Boney (who, by the way, is a "dwarf" played by Anupam Kher on his knees, a harbinger of the weirdness to come), a giant screen suddenly appears in Boney's living room. "What's this?" he asks. "It's my flashback," Suhaan answers. Later, when Suhaan is weeping to Boney via telephone from New York, the telephone booth is transported to Boney's room, glowing warmly in a beautiful and touching illustration of their connection across the seas. In another example, after a flashback sequence ends with Agastya in tears, the scene fades back to Boney's house where Boney, Suhaan, and the "present" Agastya surround the weeping "flashback" Agastya in sympathetic silence. The film is full of deft visual touches like these, some more subtle than others. One of the best things about this film is Akshay Kumar, who plays Agastya with a gentle sweetness that is a pleasure to watch. Both he and Salman bring a strong sense of comic timing to the film as well, and so the result is a story with equal parts silliness and poignancy. Preity Zinta is passable in her role, though she is the least challenged of the three, serving mainly as a surface that reflects the emotions of the two guys. This is almost made explicit when the guys, who have rented an apartment across the street from hers, train a telescope on her window, hook it up to a projector, and watch her mundane daily activities in larger-than-life projection. This device, which might seem creepy and stalker-ish in a more literal movie, works here as a symbolic expression of Priya's role. The music serves the film well, but it is powered by the visuals and would not stand as well on its own. The best song by far is the manic, bizarro-world "Jaane ke jaane na," in which musicians, clowns, and midgets stream out of Boney's cupboards and parade around his living room with a cardboard cutout of Preity Zinta. The film's first song, "Humko maloom hai," recounts Suhaan and Piya's marriage in a delightfully theatrical style, with explicit and implicit Broadway references. It is this kind of free theatrical touch that makes Jaan-e-mann a wonderfully fresh take on the standard Bollywood love triangle theme. Still, it's difficult for me to review this film. To explain my perspective, I can say that if this were not a Hindi film featuring some of the biggest names in contemporary Hindi cinema (though none of my personal favorites), I would not have seen it. If it were a Hollywood film I might have been only barely aware of its existence. It belongs to a genre - action thriller - to which I just don't pay any attention. It's just not my thing. If it is your thing - if you are capable of relaxing into the mode of the action thriller, of surrendering yourself to the particular kind of unreality that the genre presents, Don is a thoroughly fun ride. Its twists and turns, while in some cases predictable, are nevertheless well-paced and well-executed. Its sense of style is decadent and consistent. I felt that some of the fight scenes went on too long, and I was irritated by some small weaknesses in the plot, but I think these stem more from the fact that I am not an action thriller fan than from any problem with this film in particular. The film made excellent use of its exotic locale - Malaysia - with towering, vertiginous shots of the spectacular Petronas Towers and a climactic scene atop a forested mountain, perched upon a treetop network of scenic observation platforms and precarious bridges. Shah Rukh Khan is used perfectly here in the title role. He made his name as a romantic hero, and though he is a massive star he never really worked for me in that capacity. In Don, though, his slick, creepy demeanor well suits the sadistic hedonism of the character. The best performance in the film is that of Boman Irani, one of Bollywood's best and most versatile character actors, who is nuanced and intense as Don's nemesis, a ranking police official named DaSilva. Priyanka Chopra is also quite good as a woman who, having lost her brother to Don's cruelty, infiltrates his organization in search of an opportunity to take revenge. The soundtrack is a thumping techno score by Shankar-Ehsaan-Loy. I have observed with soundtracks by this team that I usually find there is one excellent song, maybe one or two that are fine but not particularly special, and the remainder range from mediocre to atrocious. Don fits this pattern perfectly. The triumphant track "Main hoon Don" is the excellent song, chilling and addicting. The anticipatory "Aaj ki raat" is also good, though I did not appreciate it until I saw the film, in which it sets a slick and smooth, yet kinetic, mood. The other tracks are neither here nor there. "Mourya re" is a colorful but forgettable festival song, the only track in which the techno beats have been laid aside. Two remakes of songs from the original, "Yeh mera dil" and "Khaike paan banaraswala" fall completely flat for me. In "Khaike paan" the techno beat just interferes with the bumpy energy of the tune, getting in the way and adding nothing. "Yeh mera dil" is overproduced drivel, a pale shadow of the funky aesthetic of Asha Bhosle's orginal rendition. Still, even if the soundtrack is not one that I will listen to on its own, it suited the mood and tone of the movie and the picturizations were diverse and entertaining, and were among the most enjoyable aspects of the film as it was going on. I haven't included Don in my "Good introductions" category, but I do think that if you are a fan of the action thriller genre, Don is an example of the best that the current golden age of Hindi film can offer. This 1957 film, which I selected on the recommendation of some of my friends at the BollyWHAT? discussion forums, has a very unusual hero – a starving, unrecognized poet Vijay (Guru Dutt). Early in the film, Vijay is driven out of his mother’s home by his brothers, who think he’s a good-for-nothing layabout; they sell his life’s work, all of his poems, to a junk dealer as scrap paper. Left with nothing, Vijay wanders the streets, encountering a prostitute, Gulabo (Waheeda Rehman, stunningly gorgeous and probably not more than 19 years old) and his old college flame Meena (Mala Sinha), now married to a big-time publisher. As (through a twisting series of events) Vijay’s poems become known to the world, he is disillusioned by the constant jockeying of everyone around him to benefit from the success of his work. 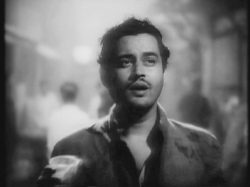 Pyaasa ("Thirst") is a beautiful film, shot with breathtaking cinematography, and the songs – whch are meant to be Vijay’s poems – are uniquely lovely. (Unfortunately not all DVD editions subtitle the songs.) Among my favorites is "Jaane kya tune kahin," which shows how breathtaking the young Waheeda was. And "Ham aap ki aankhon mein" is one of the classic genre of ballroom fantasy sequences parodied in Dil chahta hai's "Woh ladki hai kahaan." In one of its most interesting aspects, Pyaasa was sensitive to the plight of prostitutes and nautch-girls, while at the same treating society women (represented by Meena) much less kindly. The downtrodden women were shown just trying to make a living and care for their children, all the while demeaned and abused by the very men they serviced. The society woman, in contrast, was exposed as a manipulative, selfish fraud. This is the kind of message I expect in a Deepa Mehta or Shyam Benegal film - but I was (perhaps naively) surprised and pleased to see it in a mainstream film from 1957.